Five Great Games - Bolster your VR library right out of the box! Shooters, Adventures, and Puzzles, there's something for everyone. 5 Amazing Games. From Ninja Theory, creators of Heavenly Sword and DC: Devil May Cry comes DEXED. An on-rails VR shooter where Dexterity is a must. From the critically acclaimed studio, Climax comes Bandit 6 Combined Arms. 2 games in 1. Combining all the action of being a tail gunner in WW2 and fighting with stationary turrets on beachheads in Bandit 6 Salvo. Unearthing Mars is a VR adventure game set on the mysterious Red Planet. Fight, drive, experience a spaceflight simulation and much, much more. Fated is an immersive game with stunning visuals, showcasing the best that VR has to offer. Fated has a strong story-driven, narrative experience that focuses on emotion. 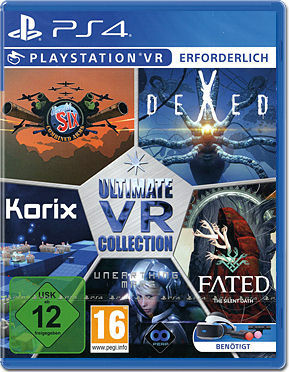 With both single and Multiplayer (2-4) mode, Kori is a fan favourite and is one of the only PSVR real-time strategy games. DEXED - An on-rails VR shooter where DEXterity is a must. Bandit 6 Combined Arms - Combining all the action of being a tail gunner in WW2 and fighting with stationary turrets on beachheads in Bandit 6 Salvo. Unearthing Mars - VR adventure game set on the mysterious Red Planet. Fight, drive, experience a spaceflight simulation and much, much more. Fated - an immersive game with stunning visuals, showcasing the best that VR has to offer. Fated has a strong story-driven, narrative experience that focuses on emotion.